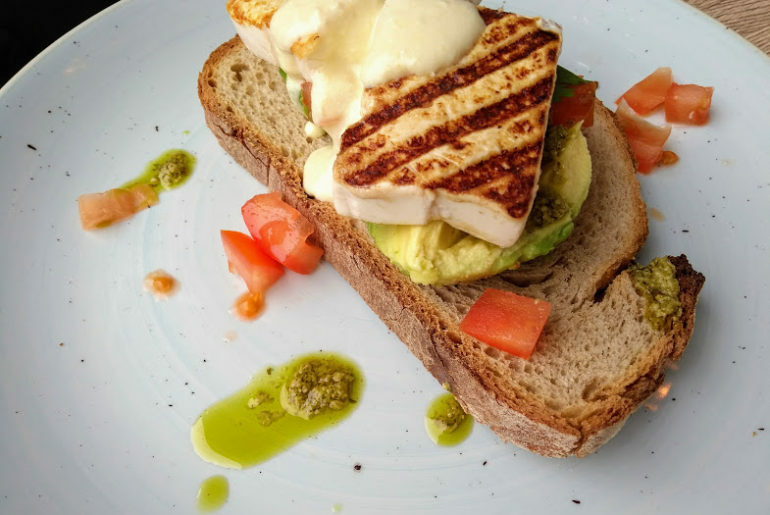 I’ve been sticking to a meat- and dairy-free diet for several months now, so when I heard on the grapevine that a new vegetarian restaurant called Oliveira was opening on our local high street, I was very keen to try it out. So keen, in fact, that me, my husband Tom, and our youngest daughter Polly, who is two, headed there for lunch on the very day it opened. The restaurant takes up two units on the busy Upper Richmond Road in East Sheen and is easy to spot with its newly painted bright blue exterior. Inside it is spacious and fresh-feeling, having just been entirely done out, and the wooden tables and exposed kitchen—strewn with fresh produce—clearly fit with the restaurant’s down-to-earth, organic vibe. We chose from the breakfast/brunch menu for our first visit. There are plenty of options, including a dedicated vegan menu. I opted for tofu benedict, which is grilled premium tofu on toasted sourdough with vegan hollandaise sauce and a choice of either wilted spinach (£7), roasted sweet peppers (£8), avocado and tomato (£10) or chipotle salsa and avocado (£11). It was light, wholesome and oh, so tasty. Tom had the vegan El Paso sandwich: potato bread, chipotle salsa, refried bean paste, vegan cheese, crispy onion and coriander (£5). He described it as delicious, fiery and filling. Polly had her favourite: simple scrambled eggs on toast for £6. We washed our brunch down with teas and coffees, but there are also some very exotic-sounding Amazonian superfruit smoothies on the menu for £5, which I definitely want to try. On that first visit, we could already see just how passionate about his produce the new owner is. Brazilian-born Emerson Amélio—who has been working in kitchens across London—was busy trialling different dishes and combinations for his new à la carte menu, determined to make his first vegetarian venture a success. He chatted to us excitedly about the fully booked opening night that had taken place the previous evening and had us try some imported jackfruit that he was creating a new curry dish with. We were so pleased with our brunch experience that it wasn’t long before Tom and I ventured back. With a babysitter in place, in the form of my mum, we headed there one weekday evening to sample the à la carte menu. It was pleasing to see that despite it being a Tuesday, the restaurant was fairly busy and had a lovely laid-back atmosphere. To start with, Tom and I shared a rosemary bruschetta: rustic sourdough toasted and topped with San Marzano tomatoes and fresh basil, which was £5. Other starters include sweet potato pierogi: a traditional Polish dumpling dish (the chef’s wife is Polish, so there are a few Eastern European twists thrown in here and there! ), or Mandoo: Korean dim sum stuffed with kimchi. For our mains I had a dish called Bronté, which is a super healthy and gluten-free meal of broccolini, okra, roasted ground chestnut, black chanterelle, kalete, dasheen, and sauce forestière (£11). 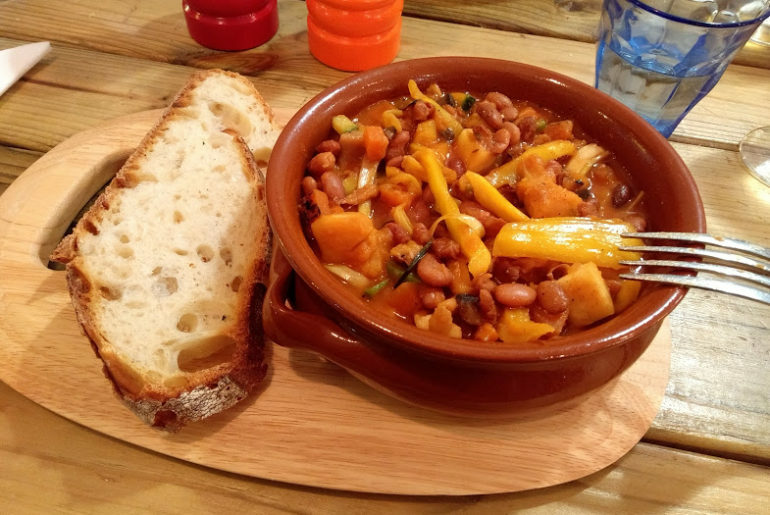 Tom had Potaje de Panpen: breadfruit and chickpeas in a Cuban-style hotpot (£12). The menu also has lots of pasta and risotto options, as well as a couple of different curry dishes. The full offering can be found on the website—oliveira-restaurant.com. For non-meat eaters, it is a rare treat to have a choice of the whole menu, rather than a token veggie dish thrown into an array of meat and fish options, although I’ve no doubt even the hardiest carnivore would enjoy a visit here too. We didn’t have dessert that evening, however there were some lovely-sounding sweet treats on offer including matcha tiramisu and cherry frangipane, plus a selection of cheeses. Once again we came away very satisfied and impressed with our overall experience. Oliveira has quickly become our new good-value go-to in the East Sheen area. If you’re nearby, I’d definitely recommend a visit.